The golden triangle area of Framingham and Natick Massachusetts is one of the most active retail districts in the northeastern portion of the United States, and while today it’s dominated by only one enclosed shopping mall, it used to be home to 5 “malls” of various size and design. 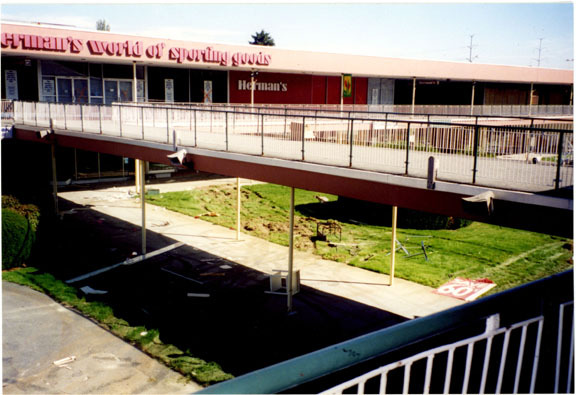 One of those was Shoppers World, which was demolished and reconfigured as a big box center in 1994. 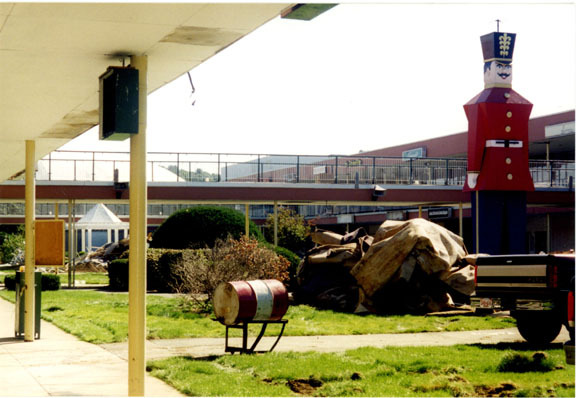 We just found a great page including some photos of the old Shoppers World in the days before it was demolished, and we’re quite impressed. 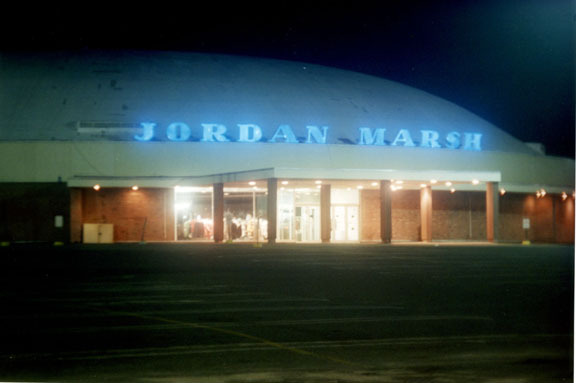 I do remember seeing the domed Jordan Marsh landmark once, right before it was torn down, but I never got to see the insides of this outdoor mall. Also make sure to note the presence of another retail relic: Herman’s Sporting Goods. Today, Shoppers World is a large big box center with stores like Best Buy, Bob’s Stores, Barnes & Noble, and Toys ‘R Us. Its smaller neighbor, the one-story Natick Mall, was expanded and renovated in 1994–the same time that the original Shoppers World met its fate–to be the dominant mall for that area, and it’s about to be renovated again to include a whole new wing that will house Nordstrom’s, Neiman Marcus, two condominium towers and almost 100 new stores, making it New England’s largest enclosed mall. There were also 3 other enclosed malls huddled around these two behemoths: the smaller Framingham Mall, which was demolished in 2000, was home to Filene’s Basement, Lechmere (a Labelscar favorite), and about 30 other stores. The Cloverleaf Mall is smaller, and we were less certain of its history before reading the article at that link, but today it hosts a Guitar Center and Burlington Coat Factory, and had a Service Merchandise until 2001. There’s a fifth mall near the corner of Route 30 and Caldor Road (tee-hee) that is really strange. So far as we can tell, it is referred to only by the unglamorous name “Route 30 Mall,” and none of the stores in the center even open into the mall corridor anymore, yet it remains open. It’s really just a glorified strip mall, anchored by Filene’s Basement, with a long hallway running behind the stores so visitors can walk to the back, home of “Lotus Flower,” an excellent local Chinese place. Thanks for publishing my photos and linking to my site. I’d love to see any photos people may have of J.M. Fields which had a store at the Rte 27 Shopping Center in Natick back in the 1960s. I have put together an article about the 1951-1994 SHOPPER’S WORLD, which I am going to submit to the webmaster at MALL HISTORY DOT COM. I was wanting to use a few photos of SHOPPER”S WORLD, such as the one of spaceship-shaped Jordan Marsh (linked above), a couple aerial views of the center (from 1951 and the 1960’s), and the panorama view of SHOPPER”S WORLD, with the Cinema on the left. I do not know who owns these photos. Could anyone here fill me in………. I mourn the old shopper’s world all the time. One of my favorite places growing up and woudl still be today if it were there. One of the biggest retail disaters in history was demolishing this place. How do the people who ok’d this sleep at night??? I too mourn the loss of the open air Shoppers’ World, as well as the first iteration of the Natick Mall, Framingham Mall, Rte 30 Mall, and Sherwood Plaza. But the biggest botch job of all was Shoppers’ World. What a mess! I avoid it like the plague now. I miss Shoppers World so much. Even though I have moved out of state, I would still go there if it still existed. What is the matter with the town of Framingham that they thought those ugly big-box stores would be some kind of improvement? I agree with michelle and Nostalgio and also avoid that rats maze now. I’d much rather have back the cool-air walks between shops (yes, even in winter) the holiday decorations, music and reindeer. I’d love to see the beautiful trees, bushes, flowers and grass than all of that impervious concrete and tar. Bad move, Framingham, for demolishing Shoppers World! It makes me sad to see this. It reminds me of when I was a child walking around there. The petting zoos, Santa, bands, the playground.. I am 32 and I am very sad to see what is happening to this once quaint area. It is becoming Brookline. I miss that old mall, too. I worked there in 1991-92, after just moving to Framingham. Unfortunately there were almost no shoppers there at that time! Sometimes entire days would go by and no one would come into our store at all. I could never figure out why since it was a great location and had a lot of decent stores. I miss that old mall, too! I worked there in 1991-92 after just moving to Framingham. Unfortunately there were almost no shoppers there at the time. Sometimes entire days would go by with no one coming into the store at all. I couldn’t understand why since it was in a great location and had a lot of decent stores. I remember the ferris wheel inside Shopper’s World. I got stuck at the top once, which to a 4-year-old seemed ridiculously high. They were enclosed oval cages for ferris wheel cars, but it still scared me to death. However, the real centerpiece was the water display with the fountains. There were colored lights underneath, and I thought it was the most fascinating place on Earth. It’s a shame it’s all changed. I drove by several years ago, but the last time I was inside was 1966. If Dave (2nd respondent, natickmass.info website) or anyone else would like a picture of JM Fields I’ve got one. But I can’t find any email address on your website to send to. I grew up going to the old Shoppers world and vividly remember Jordan Marsh, Hermans, Bretts, Radio Shack, going to the “Cinema” and having lunch at Joan and Ed’s Deli (now across Rt9 in Sherwood plaza, not the same experience though). Miss the tranquility of leaving the “Real” world and entering the mall, the grass was so green! Friday night concerts, Christmas time, etc. In the late 80’s I belonged to the “Baystate Corvette Club”, we had Corvette shows in both Shoppers World and Inside the Old Natick Mall. What a trip it was to drive down the ramp into Shoppers world, of course they made us “Push” the cars into the Natick Mall as no running engines and also they required the cars batteries to be disconnected. Have to dig out the old photos of both those events…….sigh……. And I never see mention of the “House of Zodiac”, remember that store, lower level, left side towards the back end of the mall. Tarot cards, incense, occult stuff, and other weird things!! @Dan, I know i should be working right now, but I went to Shopper’s World in 1991 and purchased a mug at the House of Zodiac. I have the mug still, in my cupboard unused. That was a funky store, still lost in the past in 1991! The whole mall was a wonderland from the past. Love this collection of photos. Lots of good memories here. Like many in my age group (early 50’s) I remember weekend trips to Shopper’s world. It was considered a “treat”. I didn’t even mind waiting for mom, while she tried on clothes, because that old Jordan Marsh store was a fun place to be. All those old stores, Laurence Stationary, Fitt’s Photo, all had good people. Of course, lunch at Friendly’s on the lower level was a fine treat indeed. A fine steak dinner could be had at the Roundup on the upper level. No comment on the Papa Gino’s that replaced it. In its heyday, Hermans was a great place for top quality sporting goods. I recognize two of the gentlemen in the photos of the old cinema lobby. They were the managers. Any idea what happened to them? I’ve never seen them at the new cinema on Flutie pass. I remember how they kept unruly teenagers in line. Dan is correct. The people who make these multi-million dollar decisions are usually suits, located in places like New York, or Los Angeles,or somewhere where huge sums of money and pieces of paper change hands daily. They don’t know, and don’t care what their actions really do. I can accept the passage of time, and that all things have to come to their eventual end. But still, it “stings” just a little. I agree, the new “shopper’s world” is simply a strip mall with a gigantic parking lot. Some things are “just wrong”, and the loss of the old shopper’s world is one of them. Does anyone remember the Camolot Lounge at Shoppers Wrold? Any one have any photos? Wow, I thought I was the only one who missed all of this……Born and raised in Natick, and having been away from there for 7+ years I seriously miss the days of Carvel on the corner of Speen and Rte 9.When Speen and Rte 9 went TWO directions only. This is the reason the world is messed up.Kids don’t have a fountain like in front of the Sears entrace to hang at. This is a great page.Thanks for the memories guys!! Wow. Looking at these pics brings back so many memories. I remember the toy soilders and the decorations at Christmas. Wish the mall was still their. I sure miss Shopper’s World. If i rote ur name in d sky wind wood blow it away.if i rote ur name in d sea waves wood wash it away.But ur name is engravd in my heart where nothin can touch it! Just to let you know, Shopper’s World and Natick Mall were both bought by Homart development during the 90’s. Homart made some decisions and decided on the current setup after Filene’s parent May Department Stores raised a fuss when the company decided to tear down Natick Mall and build the power center and a new enclosed mall at the Shopper’s World location. Was there a toy store called ‘Mr. Wizard’ (or of similar name) that sold toys, erector sets, scientific experiments for kids located at this plaza at one time? Mr Wizzard was in Wellesley Hills on Route 16 near where it intersects with Route 9. Used to build and fly model rockets there it was a great and fun place. One correction, the building that was the “Framingham Mall” (aka. “Lechmere Mall”) still exists, though its handsome glazed brick exterior has been covered in fake stucco. It currently houses Target at one end and some housewares store at the other. In short, it has become yet another glorified strip mall. LECHMERE’S……………Favorite store of all time. i kind of miss this place too- when i was a little kid i remember running up that ramp and making a left right into Toys R’ Us and it was absolutely the best place in the world. or, sometimes i’d make a right and head straight into Hobby Town. the jordan marsh had some kind of soft pretzel/fudge stand or something contained within it- anybody remember that? when i was 17 i had a summer job at Friendly’s and I was one of the 2 or 3 staff members who closed the store on the last day of business. last time i ever went to the old Shopper’s World. But life goes on! so, my question is when i go to the new shopper’s world where the heck was the old shopper’s world in relation to that? I went to college that summer I closed the Friendly’s and when i came back everything was gone- since I didn’t see the construction on a regular basis I absolutely can’t orient myself… i wish there was a map that showed the old and new structure on top of the new one. Can anybody offer any advice? @Steve, the town or Developers Diversified should have over lays of the new over the old site. I was in charge of redevelopment of the current project. The buildings were full of asbestos and other environmental issues. The road improvements and environmental issues cost over $20 million. Nice to see people still leaving comments here. Steve on your question on how to “orient yourself” in the New Shopper’s World, I’d start with Ring Road, headed toward Route 9. Just after Burr St, but before Flutie pass. You can approximate the position of the old General Cinema and go from there. Does anyone know of any other land markers that could be used for this purpose? I was just at the Barnes and Nobel this past weekend, and I thought about it again, how much I miss the old place. Who remembers the old “The Meadows” restaurant? I know Bennigans moved into the property for a short time, and it is now The Meadows office building. Really misses: The Lauriat’s Book Store, Second level. I special ordered books from there, and the employees, were glad to help. I am heart broken that they torn down Shoppers World. I lived in Natick for the first six years of my life. Since a child my family would always bring us to see the mall at Christmas time. Oh what joy it would bring us. I remember talking on the phone to Santa telling him what i would like for Christmas. I ever rode on the rides. This was back in the 50’s The last time i was there was in 58. Sadly my brother died the next summer of cancer.We lost our home due to all the bills and moved to Maine for awhile. Came back to Natick a few years later. So the mall was a special place to me. Natick was a very nice place to live back then.I lived on Overbrook terrace rd. My grandmother worked at Greco’s drug store on route 9 across from Tilly’s and Salve’s. Seems nothing is left. They even torn down my first school i ever went to. If Shoppers World could have hung on, it would probably be more sucessful today, it was different for being outdoors, but whoever thought an outdoor mall in New England was a good idea was probably the first fatal error. The domed Jordan Marsh should have been landmarked- didn’t it use to have a globe painted on it? 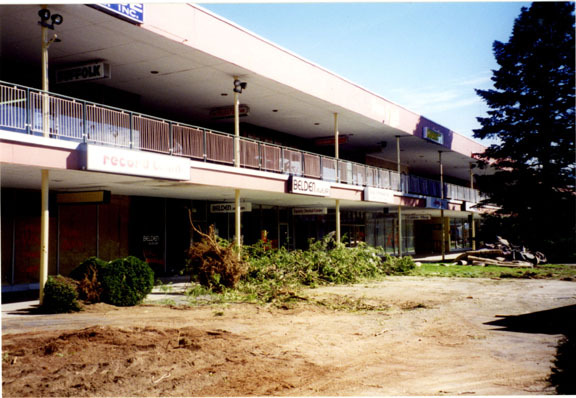 My how I pine for the old Shoppers World, and my only memories of it are as a small child (I was only 11 when they demolished it), but I knew it was a really special place. I didn’t think I remembered any of the names of the stores (except House of Zodiac and, of course, the Toys R Us!) but some of these names DO ring a bell. I always loved having my photo taken with Santa and the Easter Bunny, and I REALLY loved it when there was a petting zoo. Even though I was not yet a teenager when it was razed, I seriously mourned the loss of Shoppers World. The crap that’s there now doesn’t even compare. No comments in over a year? Wow, thanks to the power of Google I ended up here. I’ll be 38 in April…great memoreis of this epic old mall! I remember Shoppers World before Jordan’s Basement was built. That end of the mall was open. The parking lot at that end was a big field. Every year the Clyde Beatty circus would come to town and set up the bigtop there. Route 30 was a giant tree farm. I think it was called Wyman Gardens.I also remember going to the Natick Drive in and the Adventure car hop across the street. Place has no personality now, just a giant traffic jam to be avoided at all costs. From ’66-’89 grew up in Framingham & great childhood memories of Shopper’s World. Meeting friends at the Cinema on Saturday afternoons when $3.00 got you a matinee movie ticket and small popcorn. Visits to see Santa & his reindeer or paper cut-out rabbit ears from Easter Bunny. Poking around McCrory’s, Fribbles at Friendly’s, Windsor Button, getting dragged to Herman’s for camping gear, the barber shop on the 1st floor in the corner by the Cinema or Radio Shack. Purchased (more like rescued) my first pet from Dr. Pet and road the train until I could no longer fit. Those were the days when kids had innocent fun and adventure!